Left Alan's house at 8am in Jim's car heading for Bromsgrove. Good journey, arriving to have an excellent "All Day" breakfast (except Jim) at Morrisons and then a substantial shop to stock up with provisions for the week (including Pork Pie). Arrived at the boatyard before 12am and after surveying the situation, visited the nearby "Navigation" for 2 pints of London Pride, in the beer garden. 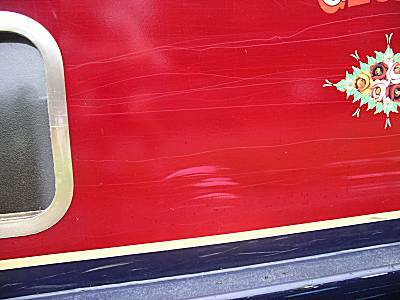 Returned to the boatyard to be allocated the narrowboat "Gloria". After loading our things and explaining our extensive narrowboat experience to the staff, we were allowed to be the first boat away at 2-15pm. Completed the ascent of the 36 Tardebigge locks in a record 4 hours, due in part to the skill of the crew and Ron's excellent navigation of the locks (Except once!!). Called into the "Tylers Lock" pub, which had previously advised us that they would be closed due to a wedding function, only to find that it was open. However, on consulting with the staff, it transpired that they would be closing early. 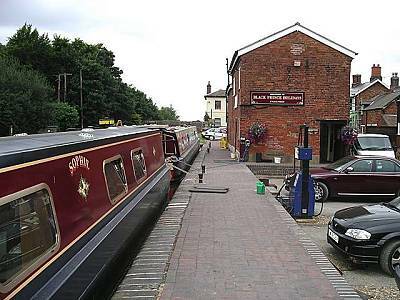 Therefore, due to the excellent progress, it was agreed that we would continue to Alvechurch, where after much difficulty we moored illegally at 7-45pm to visit "The Weighbridge" for a well deserved dinner of Steak & Guinness Pie (except Ron) and 4 pints of "Slaughterhouse Ale". Departed Alvechurch at 8-20am heading towards Birmingham. Stopped just before Hopwood for an enjoyable Breakfast 9-10 to 10-30am. Entered the Wast Hill tunnel (2726 yds) at 11-10am, taking 31 minutes to negotiate. Arrived at Gas Street Basin to fill with water and investigate mooring locations for the night. 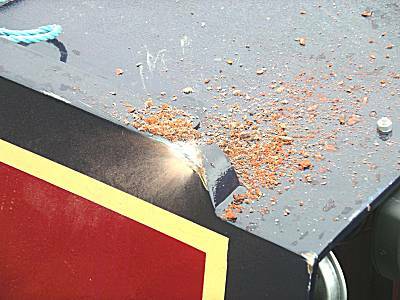 Travelled round the very narrow Oozalls Loop with only one minor collision (Ron driving) with the bow of a moored boat (See below). As there was insufficient space to turn the boat at the end of the loop, we continued on the Wolverhampton canal for about a mile to turn in a tight entrance of the Ickneld Port Loop to arrive at our mooring position at 3-30pm for the night. Just arrived at Gas Street Basin. After a pleasant late lunch of Pork Pie and salad, we went to investigate the pubs and restaurants of Gas Street Basin and Brindley Place. Found an excellent establishment by the name of the "Malt House", where a number of pints (4) of Courage Directors Bitter was consumed (see below). Visited the 'Tin Tin' Chinese restaurant for a splendid banquet, including duck. Except Jim, who returned to the boat for a tinned mackerel fish dinner. Met Jim at the local Wetherspoons for a very uninspiring pint of rather flat Abbotts Ale (except Ron). Therefore afterwards returned to the Malt House for further supplies (2 pints) of Courage Directors, until closing time at 10-30pm. Left Gas Street Basin at 8-12am where Jim navigated us carefully down the 13 interesting locks through the centre of Birmingham, beneath buildings and roads. Jim then continued to take us along the Digbeth Branch accurately negotiating a further 6 locks and through the very narrow and low Ashted Tunnel, where significant contact was made with the roof, resulting in much brick debris. (see below). Due to the high workload of the crew, breakfast was delayed until almost midday, when we moored by a new British Waterways facilities building, for an excellent breakfast prepared by Ron. Departed at 1pm where we shortly suffered prop fouling due to the very dirty condition of the canal. This required Alan to remove the access hatch and retrieve a polythene bag tangled round the propeller. Stopped at "The Boat" at Catherine de Barnes, at 3-20pm for a hurried 2 pints of Courage Directors in the garden, except Jim who enjoyed some "Old Speckled Hen". Descended the double width Knowle Locks with an interesting pirouette around the second lock basin (Alan driving). Continued to arrive at 7pm at the night's stopping point, with large portions of dinner obtained from the Navigation Inn at Lapworth, near to Kingswood Junction. Several pints of Bass ale were enjoyed by the crew before returning for an early night (before 11pm). An early start at 8-10am after a light healthy breakfast of porridge and toast. Started the descent of the 21 Hatton Locks at 10am, clearing them at 1-10pm. Continued on to the "Cape of Good Hope" at Warwick, where 3 pints of a special brew called "Two Llocks" was enjoyed by the crew, next to the canal. The less responsible members (Alan & Jim) stayed for a 4th pint whilst preparing the adjacent lock for entry by the remaining crew and narrowboat. A salad lunch, including Stilton & Onion flan, together with egg sandwiches was prepared for the crew, who enjoyed them on the move, towards our proposed evening stop at Long Itchingham. We continued through the Fosse and Bascote locks, including the twin Staircase lock, which caused some concern, as the previous boaters had not properly filled the top lock. However, with the crew's superior engineering skills, the problem was solved in time for us to arrive on time at our destination at 7-05pm. Visited the "Two Boats" public house for 6 pints of Abbots Ales (except Ron & Neil). The local fare of peppered steak (except Jim) was enjoyed by all. Departed at 8-15am after porridge and toast and paired with another narrowboat to carefully ascend the nine Stockton Locks. Called in, late morning, at the new Black Prince boatyard at Napton Junction for some running repairs on our faltering engine. The diesel engineer quickly diagnosed fuel starvation and proceeded to change the two fuel filters, together with the air filter, just in case. After prolonged moored testing the vessel was declared canal-worthy and we were permitted to continue our journey. 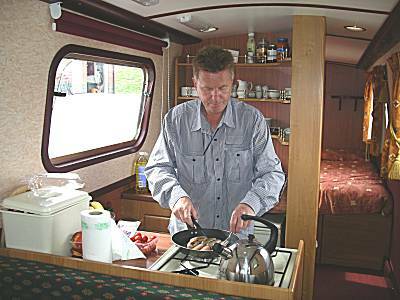 Took the opportunity, whilst moored, for Ron to prepare a healthy fried lunch of sausage, bacon and egg for the crew. Continued on to Braunston Junction, where after a tight left turn we joined the Oxford Canal heading northwards towards Coventry. Neil heroically managed an amazing emergency stop to avoid a near collision with a boat emerging from Bridge No 75, thus saving the crew from a certain catastrophe. Stopped at the Old Royal Oak, Hillmorton at 4-30pm for 2 hurried pints of Abbots and "Tom Woods Bomber County" ale, leaving at 5-10pm. Negotiated the 3 double Hillmorton Locks, with great ease (Neil driving) to continue northwards through Rugby. Arrived at the evening stop at Newbold to find mooring very limited. Stopped on a water point and were able to move back later when the boat behind moved on. Investigated the 2 local pubs nearby and chose "The Boat" for evening refreshment after it was discovered that they were serving "Adnams Broadside". Two of the braver crew enjoyed a very hot Chicken Vindaloo (Neil regretted the choice). A very early start at 7-25am stopping at 8-15am for breakfast of Scambled Egg, Bacon & Sausage, with a little toast. Stopped shortly afterwards at Stretton Stop for water and to top up supplies of Bacon, Sausages and Milk from the canalside shop. The very tight 180 deg turn at Hawkesbury Junction was managed by Ron with little apparent effort and given a score of 9½ out of 10 by the remainder of the crew. Now on the Coventry Canal we quickly passed Bedworth to turn into the Ashby Canal at Marston Junction, stopping at Bridge 5 for a visit to "The Corner House" in Bulkington for 3 pints of Marstons Pedigree Bitter (Except Ron). Observed the special 2 meals for the price of 1 offer and have provisionally planned to stop there on Friday night on the return trip. 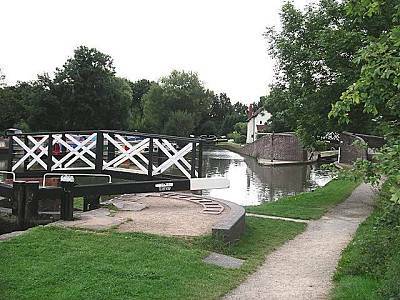 Ron and Neil expended considerable energy by walking ahead of the boat along the tow path all the way to Stoke Golding and providing a valuable look out service. The trip was particularly interesting by passing notable landmarks, such as the Triumph motorcycle factory at Hinckley. Arrived at Stoke Golding at 6-30pm for the evening mooring and a visit to the "George and Dragon" for 4 pints (Jim 7) of the Spitfire, Pedigree and Speckled Hen. The crew (except Jim) returned earlier put the final touches to the very healthy dinner of Tuna and Pasta Bake, with a little grated cheese, prepared earlier by Jim. Departed our moorings at Stoke Golding at 8-25am after porridge and toast. 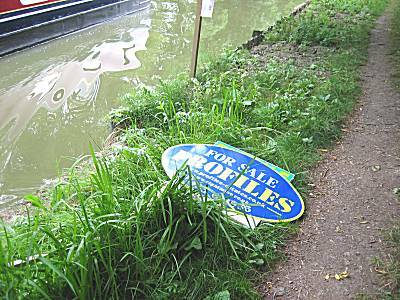 Almost immediately Neil heroically retrieved an abandoned Estate Agency "For Sale" board from the canal at full speed, putting himself in great danger, but rendering the canal safer for other canal users. The offending board can be seen below. The canal is proving to be quite shallow on several corners, causing grounding and steering problems, but disaster was averted by the superior skills the helmsman Ron. We passed the historic site of the Battle of Bosworth, where King Richard III was killed on the 22nd August 1485 and the throne passed to Henry Tudor. A long and slow journey to arrive at Market Bosworth at 11am, where we filled with water and turned the boat with a skilful "textbook" rope turn, exercised by the crew in the winding hole - see below. Jim prepared brunch of Egg, Bacon, Sausage (2), with baked beans and toast, which was consumed with great pleasure by the crew. 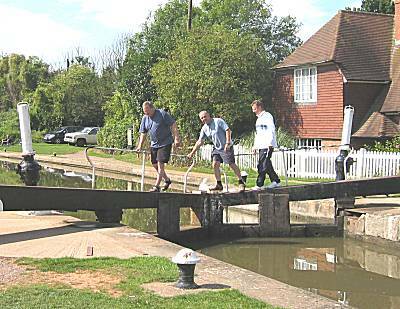 With a brainwave, Ron consulted the map and calculated that due to the route of the canal, it might be possible for him to alight from the boat, travel across the fields to a provisions shop at Stoke Golding, purchase French bread, coffee and spread and be able to meet the boat by Bridge 25. Although the crew considered this to be a daring and adventurous excursion, the requirement to gain these provisions without delaying the boat was overwhelming and the captain gave his permission for the feat to be attempted. Alan (driving) attempted not to delay the boat more than necessary and at great personal risk Ron successfully accomplished the task to the approval of the captain. Continued to the "Lime Kilns" pub, to arrive at 3-50pm. However, found the bar to be closed even though there appeared to be a private drinking party going on in the garden. The crew reluctantly returned to the boat feeling very despondent. Therefore arrived at Bridge 5 earlier than planned at 5-30pm. Mooring very limited, but was able to squeeze in at the very end of the jetty. 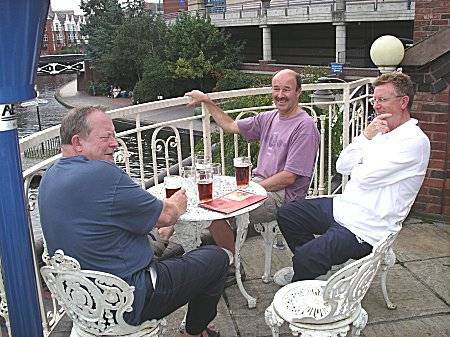 Alan found time for a little fishing before the crew headed down to the "The Corner House" pub for our promised 2 for the price of 1 steak meals (except Jim), which were greatly enjoyed by the crew, together with 5 pints of Marston's Pedigree (Except Jim 6). On seeing lightning from the window of the pub, the crew hurried back to the boat before closing time, arriving just before the rain fell very hard, which then continued for most of the night. Departed at 8-15am after porridge and toast. Continued in the intermittent rain out of the Ashby canal, turning right to follow the Coventry canal towards and through Nuneaton. Called in at the Haven Boatyard for fuel, a pump out and to fill the water tanks. It rained particularly hard during this visit. Arrived at the changeover location at "The Anchor Inn", Hartshill at 11-10am, preparing breakfast using the remaining, sausages, bacon and bread with some of Malcolm's special eggs. Waited in the bar for the arrival of the 2nd crew enjoying some of the 6 real ales that were currently on sale. After the crew arrived and the introductions completed, more ale was consumed before the crews loaded and unloaded their belongings into the boat from Miles's car. 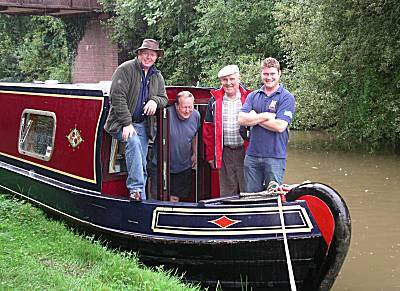 The 1st crew then departed, in Miles's car, having safely handed over "The Narrowboat Gloria" to its new crew for the 2nd week of the expedition. Despite the experience of last year's crew, the boat was moored at 7-10pm for the evening at Polesworth. Although this location proved particularly uninspiring during last year's holiday, the visit this time to the local Indian Restaurant restored the crew's faith in the town. Liquid refreshments were obtained both before and after the meal at "The Bull's Head", by the canal bridge. An early start departed at 7-30am from Polesworth, after coffee and toast, stopping shortly afterwards for a hearty breakfast. Travelling through Alvecote, descending the Glascote Locks, past Kettlebrook, skirting Tamworth, to arrive at Fazeley Junction, where much use of the boat pole and engine was required to turn the boat into the Birmingham & Fazeley canal (Smithy Driving). A little while later some considerable help was secured from a local gentleman found sitting near the first of the 11 Curdworth Locks, who kindly travelled ahead of the boat emptying and opening the gates of the 11 locks, ready for the arrival of the boat. 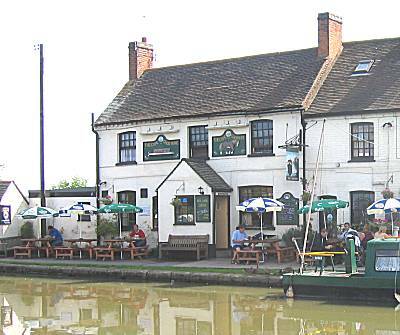 After the excitement of all the above locks, the crew found it necessary to stop at "The White Horse" in Curdworth, for a swift 2 pints, before continuing for their planned evening destination at Birmingham Gas Street Basin. The journey into Birmingham proved long and difficult for the crew with the two flights of locks into the centre taking longer than planned, as many of the latter locks were against them. Tempers were strained when Brad spent too much time from his duties taking photographs and Smithy became despondent with the constant stream of radio instructions. Jim has filed a claim for damages for an injury sustained to his leg, whilst Smithy collided heavily with the lock gates during a particularly poor approach to a lock. The boat eventually arrived into its moorings at Gas Street Basin just after 8pm, after taking on more drinking water. The tired crew took refreshments and dinner at Wetherspoons in Broad Street and later certain members transferred to the Malt House for further ale until closing time. 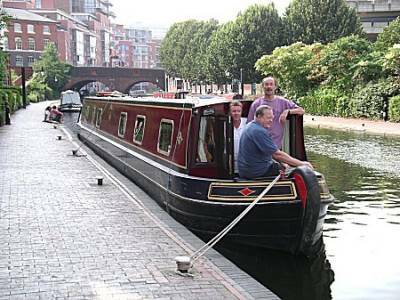 After taking on further supplies from the Spar shop in Brindley Place, the boat departed from Gas Street basin at 9-25am to head up the BCN Main Lines towards Smethwick, stopping on route for breakfast. Turned at the Dudley Port Junction to arrive at the infamous "Netherton Tunnel" (3,027 yds) at 11-25am, which was traversed with ease, in 30 minutes, by the now skilled crew. 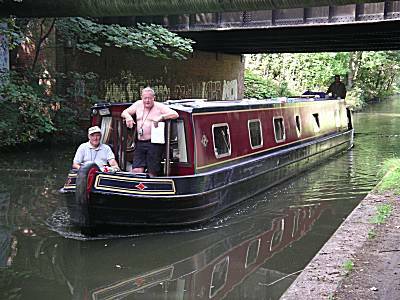 After the excitement of the tunnel the Captain permitted them an extended lunchtime stop in Netherton (12-10 to 14-20pm). As the previously visited "The Little Dry Dock" appeared to be closed, the crew tried the "Wheatsheaf" opposite for their refreshments, which was considered very satisfactory. 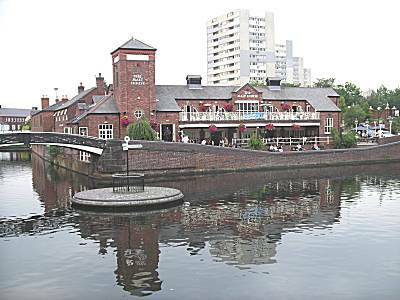 Progress continued to join the Dudley Canal and through Blowers Green Lock to near their night destination at the Waterfront Centre in Merry Hill, which was reached at 4-10pm. Miles managed an excellent approach to the mooring pontoon, which cost £5-00 per night. The crew were however obliged to remember the PINCODE of D2689, which was required to regain access to their boat. 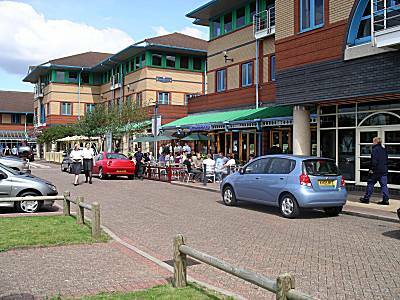 An almost immediate visit was made to Wetherspoons, where dinner was also taken later. The adjoining PJ's bar proved to be a good alternative to Wetherspoons and also became well used by the crew. It was noted that a Night Club was located near to these bars. The dress code of the local female visitors, in their abundance at Wetherspoons that evening, lifted the moral of the crew greatly. Smithy and Miles were noted not to return to the boat at a sensible hour and were rumored to have visited the aforementioned Night Club until very late. Left the moorings at Waterfront at 9am after tea and toast en route for Birmingham. 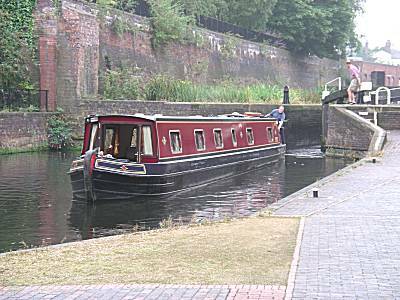 Having decided to take an alternative route back to Birmingham via the longer Dudley Tunnel (3,172 yds), the canal boat continued into the first of the Parkhead Locks at Parkhead Junction. With brilliant observational skills, Captain Jim became aware of a warning notice advising of limitations of navigating the Dudley Tunnel and the requirement to pre-book one's passage. 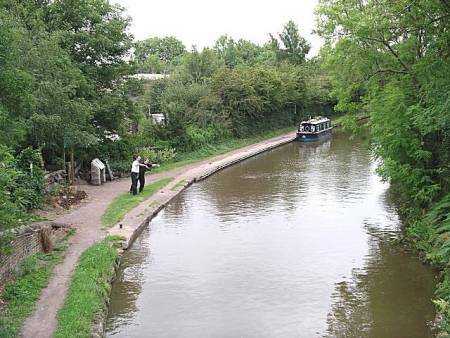 Therefore Jim was able to instruct an immediate reversing of the boat from the lock, saving it from becoming stranded for an extended period, as turning it would have been impossible. The previous day's route was therefore re-traced, stopping for breakfast and at 10-55am for a further visit to the "Wheatsheaf" for some ale to calm the crew's nerves, before entering the "Netherton" tunnel yet again. The tunnel was cleared slower than yesterday taking 40 minutes, as a passing boat was encountered, but the manoeuvre was brilliantly accomplished by Miles (driving). Miles left the boat shortly afterward having decided to jog most of the route to Birmingham to get extra exercise. Brad took control of the narrowboat, rejoining the Main Line canal towards Birmingham and negotiating the many very narrow sections of the canal. However one of the narrow sections was clearly missed by Brad who collided at full speed into the obstruction bringing the narrowboat to a shuddering halt. Jim acted swiftly by banning Brad from driving further without a lookout. 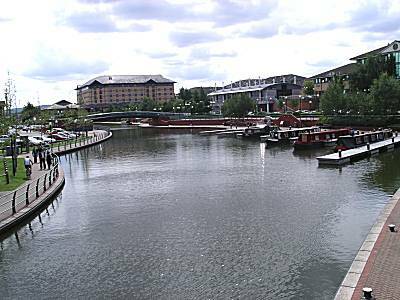 Arrived at Gas Street Basin, Birmingham at 3-15pm, which was considerably after Miles, who had arrived on foot. An immediate visit was made to the "Malt House" for a number of pints, whilst Brad visited the local Spar shop to try and obtain a supply of Whiskey to calm his nerves and help his sleep, but came back with a Cold potion, that cannot be mixed with Alcohol !!! Further evening drinking was limited as Brad and Miles were so tired that they both took to their beds for early nights. Therefore Jim and Smithy had to drink alone. Departed from Gas Street Basin to descend the 13 locks through the middle of Birmingham, where after a further 6 locks on the Digbeth Branch they turned at Bordesley Junction into the Grand Union Canal. 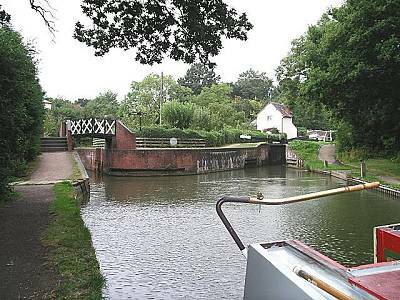 Yet another 6 locks had to be negotiated before the tired crew were able to stop at around midday for a late cooked breakfast, prepared by Brad. At this stage Alan, from the 1st Crew, who had just left a business meeting at Solihull, made contact by phone to try and arrange a rendezvous. Alan having calculated their leaving time and rate of progress felt that Bridge No 87 would be an ideal point, but on finding no suitable access onto the tow path travelled to Bridge 88, where he was able to catch a glimpse of the crew (except Miles, who was running) on the Narrowboat "Gloria" - see below. Alan managed to board the boat briefly until Bridge 87 and then returned to the car on foot to plan a second meeting at "The Boat" in Catherine-de-Barnes. This was accomplished after Alan walked back from the pub along the tow path for just over 1 mile, until the boat was sighted just before Bridge 79. 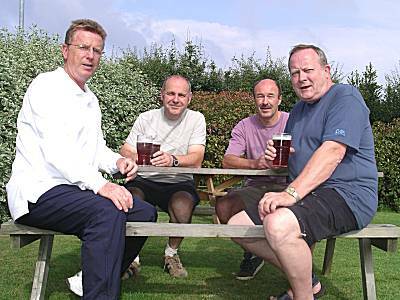 After riding back to the pub on the boat Alan joined the crew (except Brad) for a brief drink in the pleasant beer garden of the pub. Jim enjoyed several pints of "Old Speckled Hen". 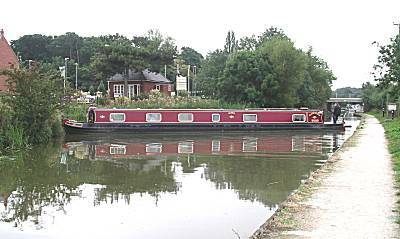 Left Catherine-de-Barnes and descended the 5 Knowle locks with little effort and continued to moor for the night near the "Navigation Inn" at Lapworth, close to Kingswood Junction. Several pints were enjoyed by the crew at this pub, together with dinner. Departed the moorings to take the narrow turn into the Kingswood Junction complex of locks (see below) to head onto the Stratford-on-Avon canal and start the ascent of the 19 Lapworth Locks, that Jim had "missed" from his spreadsheet. After much hard work, the locks were cleared before lunch and Jim felt that the crew deserved some additional shore leave. His eyes were firmly set on the pub at Hockley Heath, which is well spoken of in the narrowboat community. Arriving at Hockley Heath the crew wasted no time in visiting the Blue Bell Cider House and admitted later that they spent too long drinking their fine ales. As a result of the extended stop, the journey to the planned overnight stop at Alvechurch had to be shortened due to the light fading when they entered the Wast Hill tunnel (2726 yds). The boat was therefore moored for the evening at the "Hopwood House Inn", which had been visited on a Sunday lunchtime some 3 years earlier and fondly remembered by the Captain. The crew enjoyed the fare offered by the establishment, together with further wholesome ale. Left Hopwood at 9-10 to travel towards the Tardebigge flight of 36 locks, first having to negotiate two short tunnels. 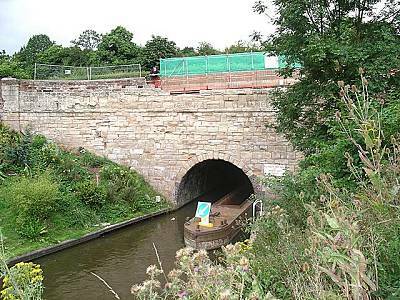 At the first of these, Shortwood Tunnel 613 Yards, whilst Miles was driving, a minor collision occurred with a passing boat, which deflected narrowboat "Gloria" into the wall of the tunnel. Having completed both tunnels and waiting an eternity for the boat to be refilled with water, the boat was moored at the Tylers Lock pub at the start of the descent of the Tardebigge Locks. However, yet again the establishment seemed unwilling to serve any ale and the Captain was heard to mutter that they didn't deserve a licence. A further 30 locks were successfully traversed, before the crew found it difficult to pass the Queen's Head at 3-10pm. A visit found the ale to their taste and the rest of the afternoon was spent at the premises. 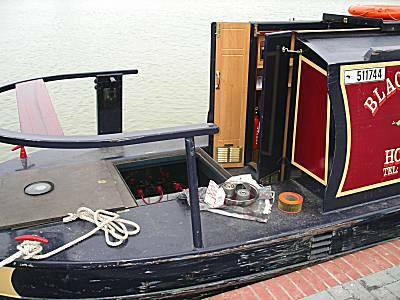 It was therefore agreed that the boat should be moored here for the night, leaving only the last 5 locks, before arriving back at the boatyard. As planned the crew rose early on their last day, despite the quantity of ale consumed the previous afternoon and evening. The final 5 locks were passed with little effort and the narrowboat "Gloria" was delivered safely back to the boatyard at exactly 9-30am. Jim made the mistake of asking the staff at the boatyard what the event was happening in the adjacent fields, only to find that it was a Steam Fair !!! Miles and Smithy refused to leave without a visit, which delayed the departure for home by some considerable time. 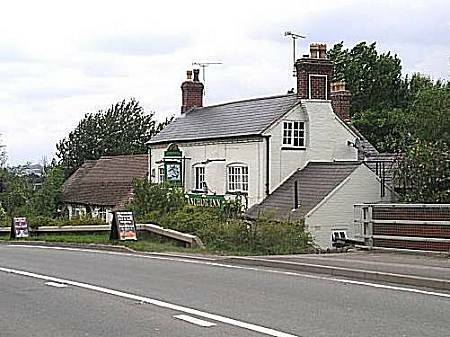 The journey home was difficult which resulted in a late arrival, severely delaying the visit by the Captain to one of the pubs in the Tockwith area. Taking everything into account, it was agreed by both crews to have been a most successful holiday and requests to the Captain have been made for him to plan another adventure for next year.